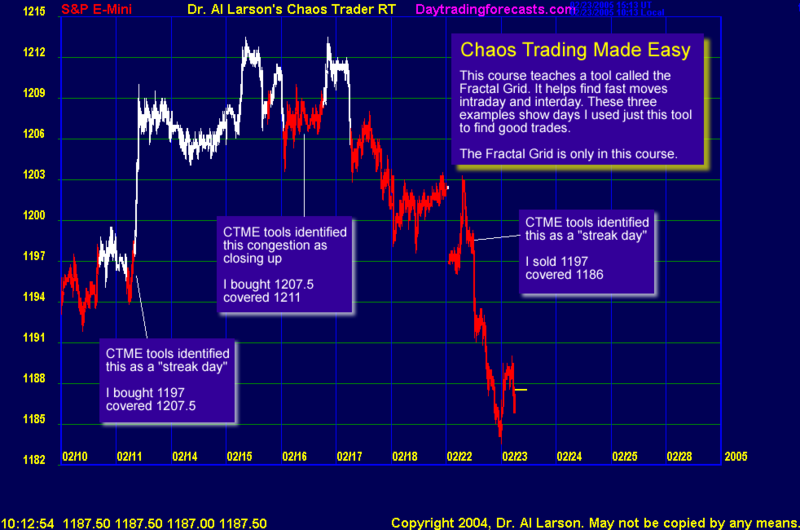 The Chaos Trading Made Easyi course is an online home study course. It was released in December of 2004. This course is not a replacement for the Cash In On Chaos Course, or the Fractal of Pi course. Rather, it simplifies chaos theory, and focuses on application. I developed this course to make trading chaos easier for those using a standard trading program. This course was developed using the eSignal charting program, since it comes free with the eSignal data feed. The indicators you need to are provided for eSignal, and thanks to Earik Beann of Wave 59, they are also provided for Trade Station and Wave 59. It is also possible to use Metastock, since what you need is either in Metastock or in their knowledge base. The goal of this course is to give you a working knowledge of how chaos behaves, how to recognize it, how to set up you trading system, and how to trade it. This course includes dozens of detailed graphic charts, and easy to grasp explanations. It also includes, for the first time ever, a brand new concept called Fractal Time. With this concept and the procedure to use it that is described in the course, you will be able to understand how fractals develop, and how to find the fast moving trades within them. This course contains homework for each chapter. If you do the exercises, you will be able to trade chaotic markets easily. While it is impossible to show you a screen set up as per CTME without giving too much away, this chart gives you an idea of it's value. That chart is basically a swing chart. The CTME material can be used on many time scales. One of my favorite uses is for daytrading the S&P eMini. 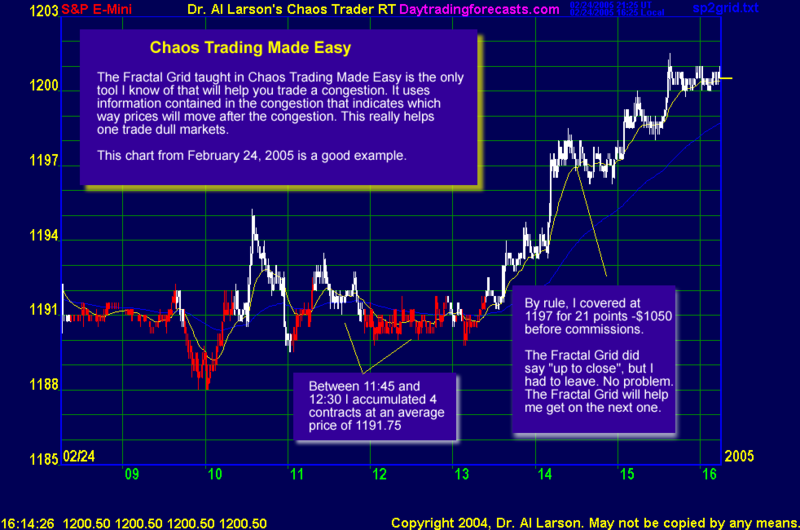 I've had inquiries about what detail the Fractal Grid can give a day trader. So on March 4th, 2005, I documented the one I used while doing the Chaos Clinic. This is it. I also get requests for people to see my account statements. Since I do not trade anyone else's money, I feel no obligation to provide them. I trade many different techniques, and it is often hard to isolate trades made using just one technique. But on this day, I did just use the fractal grid, and made it easy on myself. After all, it is very hard to trade and conduct a chaos clinic. I include this just to show you that I am a real trader. My mistakes guide my research. So when I put something out, I know it is good. The point of this is not what I made today, but what power the Chaos Trading Made Easy course has. 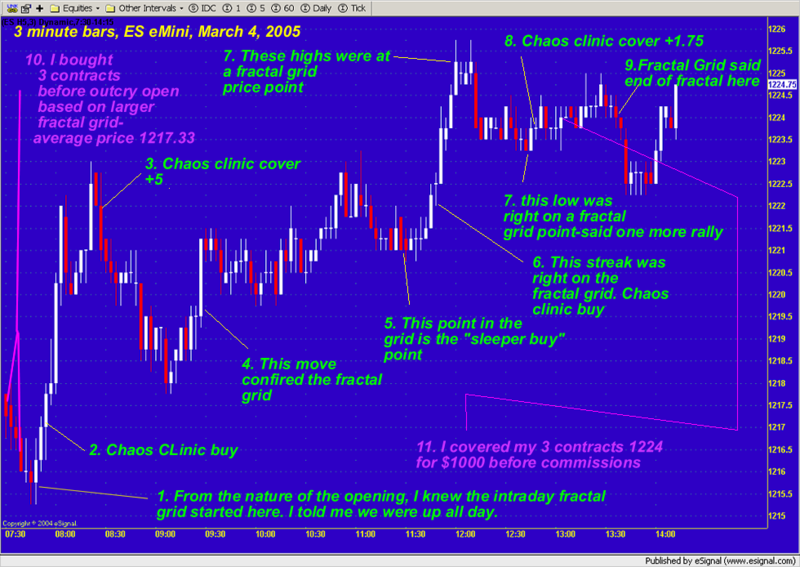 I only traded 3 eMini contracts, which can be done in a small account. You will not necessarily do as well, and you should not expect this every day. But if you can learn to find the streaks, you can give yourself a trading edge. I know many are not day traders, or swing traders. The tools in CTME work on any timeframe. While I cannot study or trade every market, I always check that my tools work in all markets, on all time frames. If they don't, I haven't done my research right. The Fractal Grid does work. Here is just one example from the Euro. Isn�t it time that you invested in your knowledge? If you want to Earn, you have to Learn. Learn to find the streaks. Cash In On Chaos with the Chaos Trading Made Easy Course.